For clinical trials and health services research. Clinvivo is a University of Warwick spin-out company. It is connected with a HEIF5 grant funding the development of technology that allows trial participants and patients to complete health outcomes conveniently on their own mobile devices. 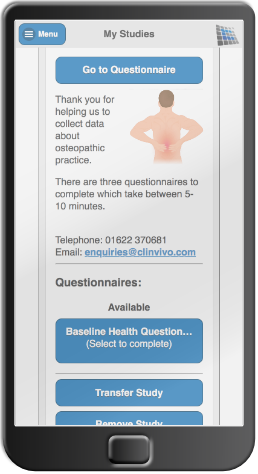 Clinvivo are committed to improving and facilitating outcome measurement in research and clinical practice. We will be keen to discuss with you how our services might benefit you, your research, or your clinic. 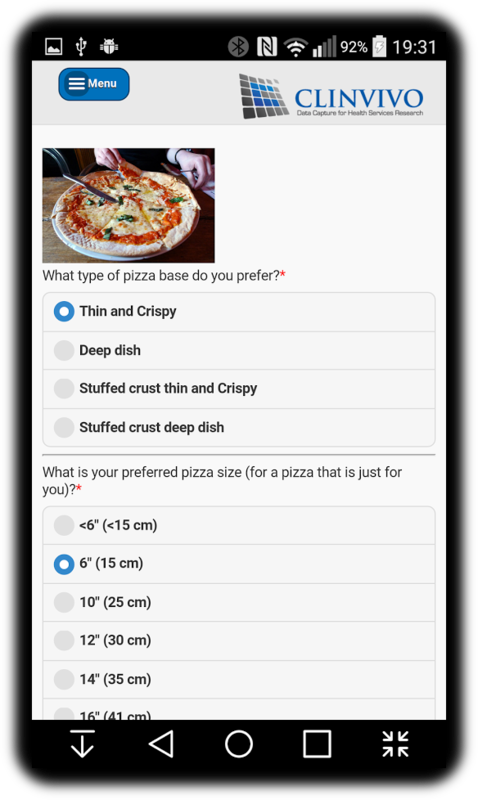 "Clinvivo ran the electronic questionnaire and data capture for a complex discrete choice experiment that was run with the University of Aberdeen. They provided timely advice and quick work on all requests, and managed the technical difficulties of accessing a diverse target group. Rob and the team were very accessible at all points of the project. Thank you!" "Clinvivo were central to organisation and delivery of a national survey of prostate cancer care in our recent NIHR programme development grant. The Clinvivo team were excellent in their support and efforts to tailor their service to exactly what we wanted for our primary research. Their electronic design and analysis services were very useful in achieving our research goals on time. We would be very pleased to work with them again in the future." 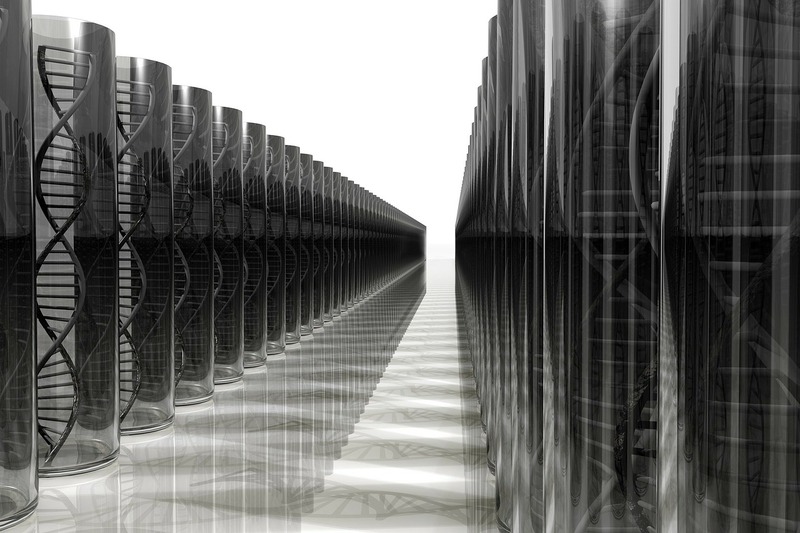 "Clinvivo conducted a large Delphi study for us. They were very professional and helpful and also really flexible. It helped that they understood the research process, as well as being able to do the programming to set the study up. When the study was up and running several people commented to us about the professional look of the on-line survey compared to others they had seen. I would highly recommend Clinvivo"
"Clinvivo helped us with an e-Delphi which sought the views of an international panel over three rounds. It certainly made the task much easier than trying to do it manually (which I have done in the past!). They provided an efficient service, nothing was too much trouble and they willingly accommodated our specific requests." Why not get in touch with us at the design stage so that we can work with you to include competative and cutting edge outcome measurement and a cost saving on traditional approaches? Not only are our services associated with a decrease in trial cost, but they are environmentally friendly too and offer many crucial advantages such as reminders to complete and time-logging. A simple intuitive design is key to ensuring good use. Our technology is easly used regardless of age and previous experience. We provide high-quality mobile phone and tablet based apps for capturing health outcomes using validated patient reported outcome measures (ePROMs). The end-users of our service are patients and academics. Our team comprises academic experts with years of relevant experience. We cater for any size of project, ranging from smaller health services research projects to full scale clinical trials. Clinvivo Ltd is a company registered in England and Wales. Company No. 8340814. Registered Office: Sportsman Farm, St. Michaels, Tenterden, Kent, TN30 6SY.